“When I assumed the responsibility of being Parliament Speaker, I assumed responsibility for the fulfillment of all the obligations and powers provided for that office,” said Talat Xhaferi, the parliamentary speaker, on Thursday. president of the state, in case presidential elections fail. At a briefing with the media, Xhaferi explained that if the census of 40 percent turnout in the second round is not reached, the elections will be considered unsuccessful, and the presidential election procedure will be repeated within six months. Asked, however, whether he was seen as a presidential candidate, Xhaferi remained in his position that he was the parliament speaker and that he does not decide who will be the parties’ presidential candidates. Xhaferi confirmed that he will schedule the presidential election by February 8, to be held on April 21, and the second round on May 5, because, as he said, these are the last legally allowed deadlines before the expiration of Gjorge Ivanov’s term. As for the possibility of early general elections, the parliament speaker remained on the party’s stance that it was not the right time for that, and pointed out that the deadline for forming a technical government had already passed, and that general elections could be held talong with the second presidential circle. He pointed out that only a request signed by at least 61 MPs would be considered as a legitimate request for dissolution of the parliament, which is the necessary majority for such requests. Estimates in political circles show that the chances of insufficient turnout in the decisive round of presidential elections rose sharply after the DUI’s announcement two days ago that it practically “freezes” the idea of ​​a consensual presidential candidate, that is, of a joint candidate with coalition partners in the government in the upcoming election. The independent performance, according to estimates, would break up the votes in the first round, but would also show the real rating of the ruling parties, while in the event of a joint appearance, the votes will be recorded in one account and it will not be possible to calculate how many of them are supporters of DUI, especially given the respectable support that SDSM has in Albanian voters. It is estimated that in this case, DUI will not have the best results, which is why it insisted until recently on a consensual candidate and “wrote off” the possibility of early general elections. On the other hand, calculations say that in the second round, in the event of a silent boycott by DUI and VMRO-DPMNE, chances for the presidential elections to fail in the spring will increase, after which the presidential post will be assumed by Speaker Xhaferi, who would continue to appear as Parliament Speaker, but will have to appoint one of the vice-presidents to hold sessions in his place. 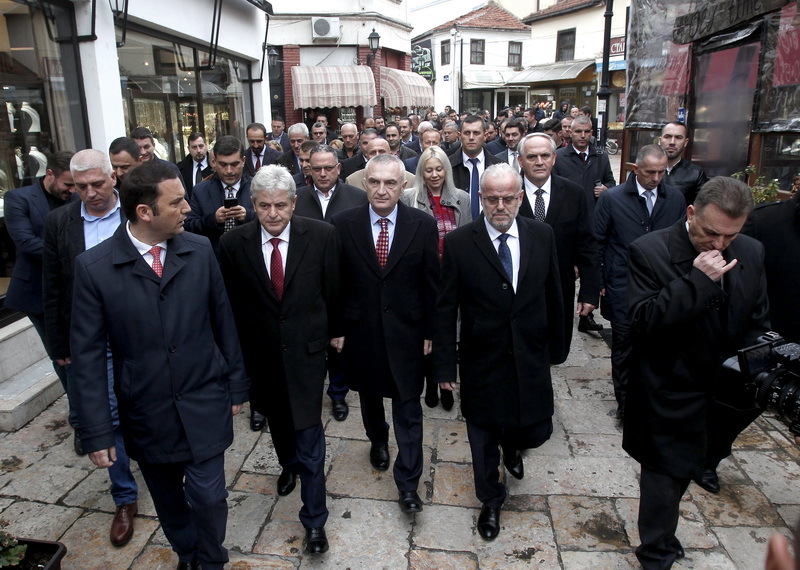 Such an event occurred in 2004, after the death of the then President Boris Trajkovski, when Parliament Speaker Ljupco Jordanovski became acting president. The difference is that then extraordinary presidential elections were held within the constitutional deadline of 40 days. This time, the possible presidential election of Xhaferi, as it is announced, would be delayed by half a year, given the hints that the constitutional changes for amending the election concept for head of state are not excluded. It is a long enough period to change the political situation in the country, but also to strengthen the positions of DUI as a party that would control the two formally highest functions in the country. A senior SDSM official doubts that the “old ties” between DUI and VMRO-DPMNE have reemerged in the past period and that this is one of the reasons why Ali Ahmeti “suddenly” froze the idea of ​​a consensual candidate he has advocated since 2014. But, unlike five years ago, when VMRO-DPMNE reportedly did not accept Ahmeti’s proposal for a joint presidential candidate, so DUI abstained from the presidential election, this time the ruling Albanian party decided to participate directly in the elections. According to estimates, this decision was not accidentally announced after it became almost certain that the presidential election will not merge with early general elections, as one of the scenarios that could have contributed to raising the turnout in the second round of elections. In addition, coalition partners in the government have come across more speculations and disagreements over the past period, starting with DUI’s attitude towards the SPO, “taking someone else’s credit for the Law on Languages, the adoption of the Anti-Discrimination Act, etc. To the latest affair around PIOM and the second Pension Fund. In the meantime, several criminal investigations against DUI officials were also opened, and there was also information that this party is actually behind the idea of ​​amending the Criminal Code, in the Article for abuse of office – which was withdrawn at the last moment before the rounding up of the constitutional changes in accordance with the Prespa Agreement. “There should be a consensual candidate in the upcoming presidential election. This idea was also mentioned in the last presidential election, because the role of the president is to be a cohesive factor in society, a voice of reason in times of crisis that has been missing so far. That idea goes beyond political mandates and we believe that the idea of a consensual president should be applied in Macedonia, which at the very least needs to represent the will of the two largest ethnic communities, but also everyone else.” This was said by Deputy Prime Minister Bujar Osmani on Tuesday afternoon at a joint press conference with the ministers Radmila Sekerinska, Oliver Spasovski and Nikola Dimitrov, when the steps for the implementation of the Prespa Agreement were announced after its entry into force. Not even 24 hours passed, when Osmani as a spokesman for DUI, announced from the headquarters of the party in Mala Recica that the party the very next day decided to run with its own candidate in the presidential elections. However, since he did not completely close the door for an agreement on a consensual candidate – with SDSM or with other parties from the Albanian bloc, this sharply changing attitude of DUI is interpreted in political circles as a kind of pressure on the coalition partner. The Alliance of Albanians led by Zijadin Sela welcomed DUI’s announcement of an independent presidential candidate in the upcoming elections.